Phew! A Stinking PA Festival! 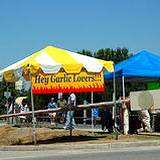 Now you can enjoy two full days of every delicious garlic dish you can imagine at the Pocono Garlic Festival. It's all neatly tucked away in the beautiful Pennsylvania Mountains at the Shawnee Mountain Ski Resort. It's a stinking Pennsylvania Festival you're gonna fall in love with! Here is another unique Pennsylvania Festival that is full of surprises, great food, entertainment and good old fashioned Pennsylvania hospitality. 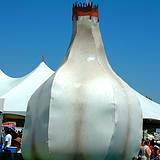 Always expect the unexpected when you attend a Pennsylvania Festival and the Pocono Garlic Festival is no different. Where else can you get a garlic education? Watch demonstrations of authentic garlic braiding. Once you see the finished product you'll realize garlic is not only great tasting with amazing health benefits, it can also turn into an enchanting work of art. You'll get a kick out of how involved the vendors, entertainers and even the visitors interact when they use their imagination to make this PA festival a treat for all involved. This year is expected to be their biggest event ever. Especially since they decided to switch the festival events to the Shawnee Mountains Ski Area. The event planners are expecting over 25,000 visitors to their community. It's a typical annual Pennsylvania event that gets the entire community involved. Enjoy browsing through the garlic markets you'll be amazed at what you'll run into. Here's your chance to get stocked up on your garlic supply before winter. After all, many science studies prove eating plenty of garlic helps your immune system fight off colds and flu. 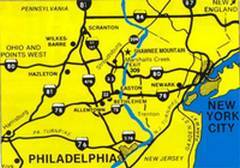 Have you ever wondered how Pennsylvania people stay so healthy? Hmmm, maybe it's all that gourmet garlic they grow and cook. Do you know that most of the garlic you buy in the grocery stores is grown in china? 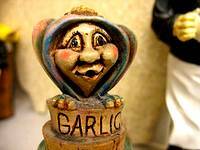 Garlic keep a long time if stored right. 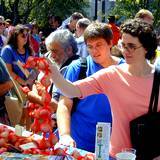 Go to the festival and stock up on your Winter supply of garlic, grown right in PA! 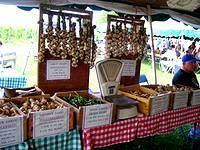 The majority of the garlic you'll find at the Pocono Garlic Festival is grown at the local garlic farms. Much of the garlic you'll find here is a special gourmet garlic that can't be found in your local supermarket. 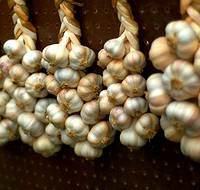 At the markets you can buy your garlic by the bulb or invest in an artistic braid of garlic. Either way you buy your fresh Pennsylvania grown garlic once you taste it you'll find yourself wishing you would have bought more. You'll be amazed at the various garlic gadgets you can buy. Find gadgets to press garlic, roast garlic, peel garlic and chop garlic, you'll even find cute pieces to store your garlic in. Bring along your shopping bags, you'll be so glad you did. Don't forget to bring your coolers! You'll find the variety of garlic dishes endless and you'll want to sample them all. Of course you won't be able to do it all in the time you're there. So store some of the dishes in your cooler and enjoy the great food at home. It's a garlic lover's retreat. Eat as much garlic dishes as you want and talk to anybody with no fear of offending! OK, some of the dishes are going to be weird but what the heck, get a sample. 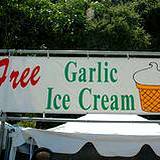 You never know, you just might enjoy garlic ice cream. Um, how about a garlic slurpie or a garlic funnel cake? You just never know what you will be sampling. Of course not all the dishes are weird. You'll find dishes that not only taste delicious they smell wonderful too. It's one day you'll want to leave your diet at home and just enjoy a day of good food and Pennsylvania hospitality. Have you ever tasted fresh roasted garlic? It's so popular now you can even buy an appliance to roast your garlic to perfection. You'll be surprised at the gourmet dishes prepared by local chefs. Over 35 local restaurants compete for you attention with dishes like, lemon grass garlic chicken and hot garlic wings. Just bring your taste buds and an open mind and you'll enjoy every second of this famous Pennsylvania festival. To top off all the food festivities you'll also be entertained with local jazz bands, dancers, singers, banjo players and simple old-fashioned folk music. The one band that is the hit of the Pocono Garlic Festival is The Garlic Eating Tuba Troubadours! 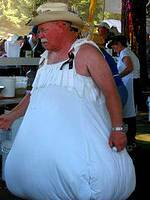 These tuba players gather from all over the East Coast to enjoy this garlic festival every year. After munching down on all their garlic favorites they settle down to play their tubas and fill the air with the great aroma of garlic breath! It's all fun and it couldn't be held in a more beautiful area. It's a unique Pennsylvania festival that's an annual event that you'll want to enjoy every year that will giving you plenty of bragging rights. How often can you brag to your friends that you just came from a stinking Pennsylvania festival and loved every minute of it? Shawnee Mountain Ski Area is only minutes from Courthouse Square in downtown Stroudsburg and is located in Shawnee On Delaware. Children's admission price includes use of Shawnee Place.